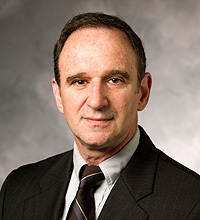 Martin Hellman will discuss the nuclear threat in the eighth annual Maitra Memorial Lecture. Martin Hellman, an eminent engineer whose latest project focuses on reducing the risk of nuclear war, will give the eighth annual Sidhartha Maitra Memorial Lecture at UC Santa Cruz on Saturday, October 18, at 4 p.m. in the Baskin Auditorium. The event is free and open to the public. Hellman's involvement in efforts to defuse the nuclear threat began in the 1980s, when he worked with the Beyond War Foundation. His current project advocates the use of formal risk analysis to assess nuclear weapons policies. According to his analysis, the risk of a nuclear catastrophe is far greater than most people think. At the same time, he says, "our ability to reduce that risk is far greater than we imagine." In his talk for the Maitra Memorial Lecture at UCSC, titled "Soaring, Nuclear Weapons, and World Peace," Hellman will draw on his experience as a glider pilot and his expertise in encryption methods to illustrate the unacceptable level of risk now facing our society. In Hellman's view, the missteps that had the world teetering on the brink of the nuclear abyss during the 1962 Cuban Missile Crisis are being repeated in current events, such as the ongoing conflict between Russia and Georgia. A professor emeritus of electrical engineering at Stanford University, Hellman is famous for his invention (with Whitfield Diffie and Ralph Merkle) of public-key cryptography, the basis of secure transactions on the Internet. He has been a long-time contributor to the computer privacy debate and served on the National Research Council's Committee to Study National Cryptographic Policy, the main recommendations of which have since been implemented. Hellman is a member of the National Academy of Engineering, a fellow of the IEEE and the International Association for Cryptologic Research, a Marconi international fellow, and recipient of a 1984 IEEE centennial medal. He received his B.E. from New York University and his M.S. and Ph.D. degrees from Stanford University, all in electrical engineering. For more information about the Maitra Memorial Lecture, call (831) 459-5003 or e-mail specialevents@ucsc.edu.